Excursion: New 3 day tour! This new three-day tour takes in two fabulous Scottish cities and a famous and awe-inspiring event. As you’d expect, Burland excursions have selected one of the nicest hotels in the area for a 2 night stay, with a quintessential Scottish feel and freshly cooked local Scottish food. The two cities in question are the wonderful Stirling and world-famous Edinburgh. Stirling offers cobbled streets, live entertainment, shopping and historic attractions. The historic Old Town boasts the finest concentration of historic buildings in Scotland. Of course, there is also the splendour of Stirling Castle and the Argyll and Sutherland Highlanders Museum. Accommodation for the two night excursion couldn’t be better and is right in the heart of Stirling, and somewhat of a tourist attraction in itself! For over two hundred years, guests have been welcomed in through the handsome stone entrance of the Golden Lion hotel, with royalty and Scotland’s national bard, Rabbie Burns, among them. The second part of the excursion is Edinburgh - Scotland’s compact, hilly capital. It has a medieval Old Town and elegant Georgian New Town with gardens and neoclassical buildings. Arthur’s Seat is an imposing peak in Holyrood. Perhaps the highlight of the trip is The Royal Edinburgh Military Tattoo. One of the greatest shows on earth. A thrilling mix of music, ceremony, military tradition, theatre and dance. The Tattoo is an iconic Edinburgh institution, and a sell-out year after year after year. More than 14 million people have seen it over the years. We set off from Cheshire on route to Scotland. There will be a stop off or two on the way to get refreshments and stretch your legs. On arrival in Stirling, you can then check into the Golden Lion Hotel and have some well-earned relaxation time. Spend late afternoon exploring Stirling, there is plenty to choose from. Then return to the Golden Lion Hotel for a glorious three course meal, included in the price of the trip, perhaps with a glass of wine or two. Day 2 - Edinburgh and The Edinburgh Tattoo Start the day with a home cooked Scottish breakfast, the perfect way to start what is a busy day. This is included in the price. We will then drive to Edinburgh. You’ll have time to explore the city before the Tattoo. Most of our customers choose to have a snack lunch whilst sightseeing and then sample a famous Haggis supper before the start of the Tattoo! 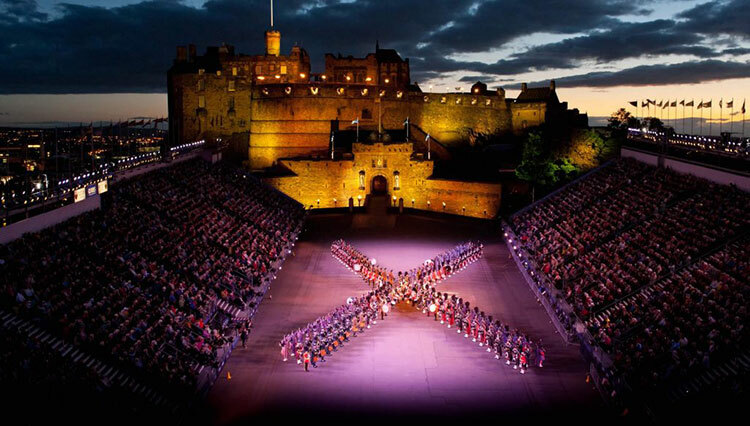 You’ll then enjoy the stunning Edinburgh tattoo with pre-allocated tickets (included in tour price). After the performance, we will head back to the hotel in Stirling where you can enjoy a late nightcap (or late supper) if desired. Day 3 - Breakfast and Home…. You’ll get a second chance to sample the hearty Scottish Breakfast that the wonderful Golden Lion has to offer. Early risers will get some time to spend in Stirling if they wish, as the hotel is so central it is easy to explore. We’ll then start our journey southwards and homeward bound, leaving Scotland in our mirrors. Location: In the early 1780s James Wingate, a Stirling business man, commissioned the famous Scottish architect Gideon Gray to build a hotel on the site of The Gibb’s Inn Tavern and Lodgings, located in Quality Street Stirling. Room Facilities: Ensuite bathrooms. Flat screen TV. Free WiFi in public areas. Please note: With cobbled streets in both cities and steep steps up to the Tattoo seats, this tour is not recommended to people with walking difficulties.